Laos often surprises travellers. Less known than the other countries in Southeast Asia, it has more to offer than people would guess. From golden temples to caves and waterfalls, all lacking the hordes of tourists that you encounter elsewhete in the region, the country does not disappoint. Come quickly before the world discovers this hidden gem. 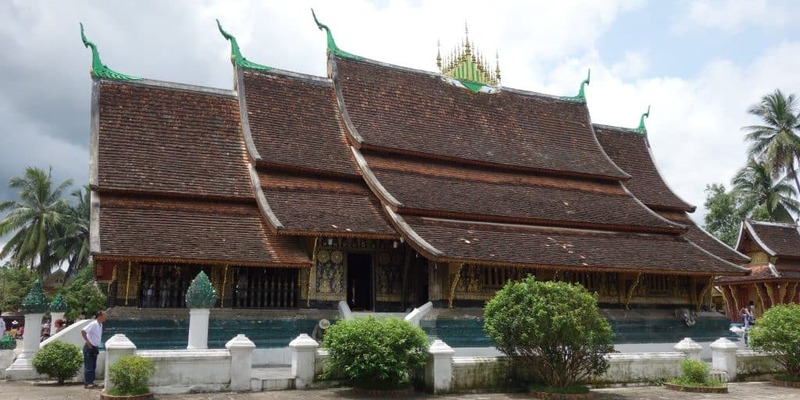 Luang Prabang is known for its temples and its monks strolling through the streets. You can find some of the country’s finest architecture in this city. A good place to start is Wat Xienthong, a sparkling complex of gold, green and ornate roofs. Also, make sure to climb up the hill to Phou Si. From here, you have an amazing view over the city. 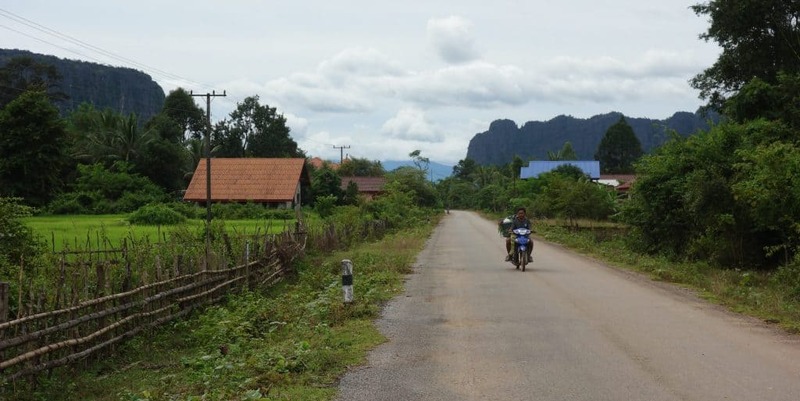 Did you know that Laos is the most bombed country in the world? The population suffered greatly in the Vietnam war, even though the United States never officially declared war with Laos. Some regions of the country were assigned as drop-off zones, where pilots who had missed their targets could drop their remaining bombs before returning home. Not all of those bombs have exploded. In fact, experts estimate that almost 80 million unexploded bombs remain in the country, injuring people every day. The COPE Visitor Centre is a great place to learn about the remaining unexploded ordonance. Entrance is free, but donations are welcome and go towards locals injured by bombs. Luang Prabang and Vientiane are great places that will keep you occupied for a couple of days. However, do not miss the quiet countryside. Here, you can cycle through rice paddies so green that they almost seem unreal, trek to tiny villages and meet friendly locals everywhere you go. Luang Namtha is a great place to start, but I also greatly enjoyed the countryside around Kong Lor Cave. A cooking class is a great way to learn about local food. I did one with Tamarind Restaurant in Luang Prabang, but you will find opportunities for cooking classes all over the country. We started with a market tour in the morning, learning about local ingredients I had never seen before. Afterwards, we drove to the kitchen and started preparing various dishes, from the traditional spicy dipping sauce Jeow to lemongrass filled with chicken. I got a small cookbook to take home so once I go back to Germany, I can cook those dishes for friends and family. 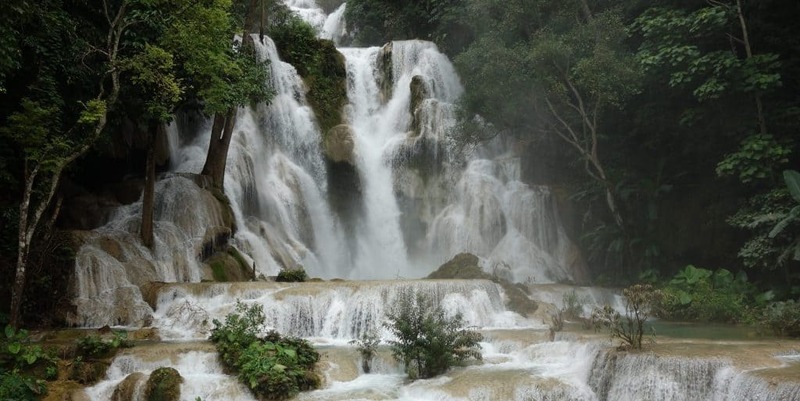 Kuang Si waterfall is located near Luang Prabang. Water flows down a giant waterfall before cascading down along several turquoise pools. You can go swimming in most of them and there is the option to hike to the top. The path is slippery but worth it, as up here, you will have the option to go swimming and see the waterfall and the jungle from above. And if you like, you can also find a swing attached to a tree or you can take a boat to the source of the waterfall. 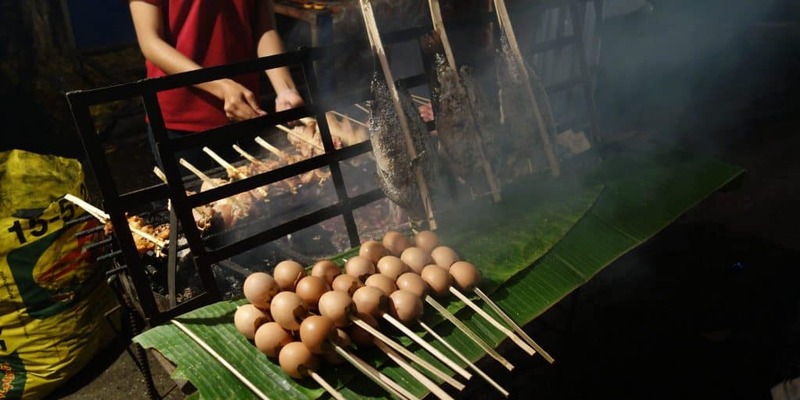 Whether you want to go shopping or go out for dinner, you can do both at Laos’ night markets. Both Luang Prabang and Vientiane have large markets that open up in the evening, but we even found a tiny one in sleepy Savannakhet. The food offered at those night markets is cheap and usually of good quality. 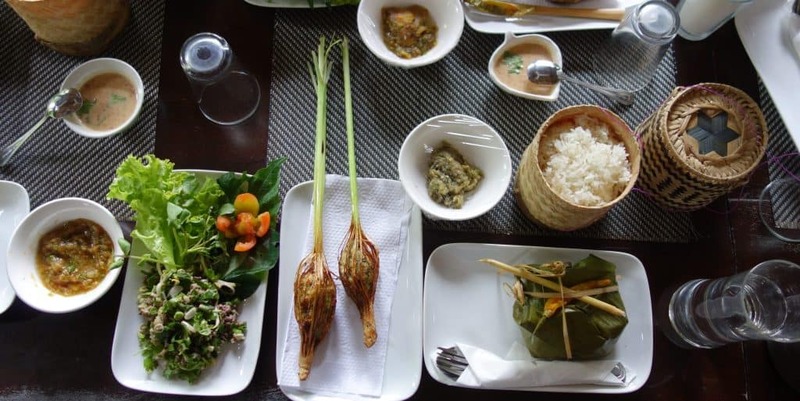 Look around and you will find various different dishes on offer, including packages of banana leaves that can contain everything from meat to fish to rice dishes. Depending on which market you go to, you might also be able to buy souvenirs, clothes and jewellery. Easily accessible from Luang Namtha, Nam Ha National Park offers great opportunities for both hiking and kayaking. Ask the tour operators about the best way to get into the national park. Paths can be muddy in rainy season or water levels low in dry season. Since we were in the middle of rainy season, we went kayaking and had a lot of fun going down the rapids on the river. We had lunch served on a banana leaf and went to visit a local village, a great way of getting to know the way of life of people in Laos’ mountains. 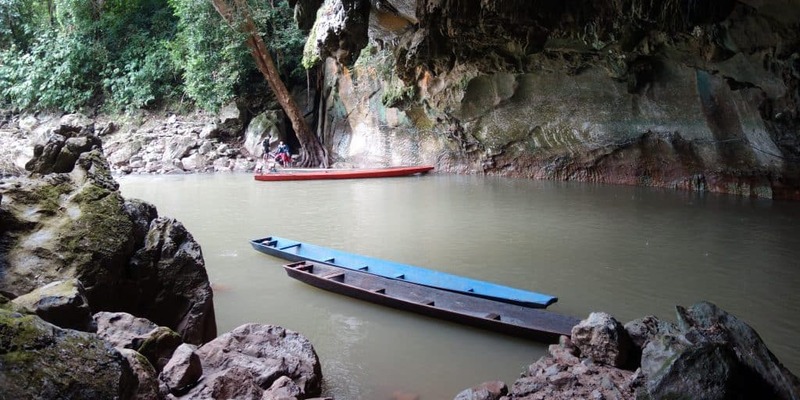 Kong Lor Cave is seven kilometers long, with a river running through it that can be explored by boat. Starting at one end, we went from one entrance to another, driving through the darkness. Some sections were small, while others were huge. In places, the cave is up to a hundred meters wide and a hundred meters high. You will get a torch with which you can barely see the giant rock formations around you. To get to Kong Lor, you need to take a bus until you reach an unpassable bridge shortly before the village. Here, you will need to cross on foot and resume your trip in a tuk-tuk. I highly recommend making the detour to get here. 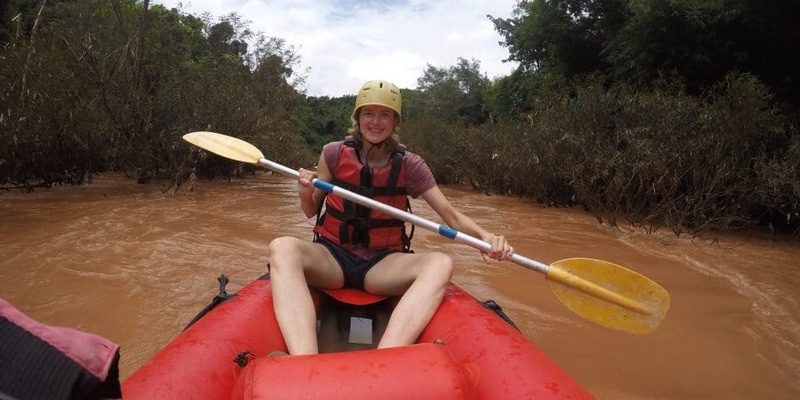 Not only is the cave impressive but this is also a great way of seeing the Laos’ countryside. When the French left Southeast Asia, they left a trail of French bakeries behind. No matter where in the country you travel to, you can be sure to find a decent bakery that serves you baguette and croissants. Besides the many French bakeries, you can also find a Scandinavian one in Vientiane. I highly recommend the punschrulle, a bright green Swedish pastry that tastes just like home. When I went to Vang Vieng a couple of years ago, the main tourist attraction was tubing, which basically consisted of floating from bar to bar in a rubber tube. After too many drunk tourists dying, tubing has been forbidden, but Vang Vieng remains a tourist destination. Whether riding a boat to take in the stunning limestone scenery or going rock climbing, you will find lots of things to do in this town.